The Strange Magic Of YouTube's '80s Remix Culture Search the phrase "80s version" and you'll find dozens of present-day hits reworked with vintage synths and sax solos. Embedded in them is an emotional lesson on what's missing from the streaming era. 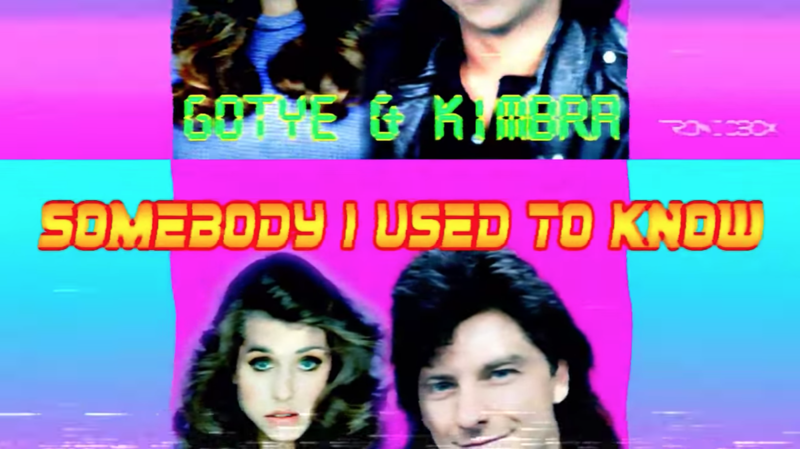 The '80s VHS-style art for Gotye's "Somebody That I Used To Know" as reimagined by YouTube user TRONICBOX. Whether you thought of the 2000s emo-punk boom as watershed moment or the nadir of modern music, there's one song from that era that's hard to forget. Fall Out Boy's first major hit, "Sugar, We're Goin Down," became an anthem for scrappy underdogs when it arrived in 2005, and its sound is still unmistakable: churning guitars, piano twinkles and Patrick Stump's roller-coaster vocals, kicked off by two bars of tripping-over-your-own-feet drums. The instant it starts, you know what you're hearing. In early June, a fan-made remix of "Sugar, We're Goin Down" popped up on YouTube. Slower and more wistful, this version wraps Stump's vocal track in gauzy synths, cascading harmonies and a synthetic sax solo — and rather than defiant, it plays like the sonic embodiment of an unrealized crush, all lovelorn and yearning. By the time the chorus hits, it's clear we're not in the LiveJournal era anymore: This is the kind of pastel-hued song that could soundtrack an awkward junior high slow dance in 1986. The "80s remix" of "Sugar, We're Goin Down" is the creation of a musician from Norrköping, Sweden, named Johan Olsson. The 23-year-old multi-instrumentalist — he plays guitar, piano and bass and also sings — has his own band, ms. mullins. (The group's debut EP was released June 29, and a lush, dream-pop single, "7 Years," is streaming now). Olsson decided to create this remix after encountering a YouTube video of Stump's isolated vocal track. "I started trying out some chords, and it just evolved from there. REO Speedwagon was one of the main inspirations," he tells NPR Music. His Fall Out Boy experiment is his second viral hit this year, following a rework of Green Day's "Boulevard of Broken Dreams" that exudes Miami Vice intrigue rather than suburban ennui. Olsson is not the only musician dabbling in this era. Search the phrase "80s remix" or "80s version" on YouTube and you'll find thousands of synth-drenched takes on modern pop and rock songs. The trend began bubbling up in earnest in 2016, when a Canadian musician and software developer named Jerry Shen, who runs a YouTube channel under the name TRONICBOX, found Internet fame with two Justin Bieber remixes: "What Do You Mean It's 1985?," a reimagining of the titular 2015 hit, and a sitcom-theme take on "Love Yourself. Remaking popular songs in incongruous styles is a practice as old as elevator music, and its standouts tend to trade on novelty. Consider "Weird Al" Yankovic's gleeful polka hits medleys, or the U.K. troupe Mike Flowers Pops, which does cheeky lounge versions of popular songs (notably Oasis' "Wonderwall"), or the long running Punk Goes... compilation series where young, loud bands tackle the pop canon. The digital mix-and-match of familiar sounds has an immediate ancestor in 2000s mashup culture: Think of the genre clashes of 2manydjs and The Hood Internet, or the revelatory hip-hop/Beatles conflation of Danger Mouse's The Grey Album. Mashup superstar Girl Talk even sampled the "Sugar, We're Goin Down" drums in his own "Smash Your Head." And yet, '80s remix culture feels distinctly of its moment. Many of the videos extend their concept to the thumbnail art, where Photoshopped visions of Katy Perry in spandex workout wear, Rihanna with teased hair or Justin Bieber with a mullet are adorned with fake artist logos in neon colors and bubbly fonts — a cousin of the absurdist mock-ups that light up social media. Moreover, creators and listeners are in on the humor together: As with any good meme, appreciating these remixes involves a shared in-joke. "Definitely my favorite singer from that decade," one listener deadpans in the comments section of a take on Ed Sheeran's "Shape Of You" that recalls snappy Minneapolis funk. "What is he doing now? He kind of fell off the radar after 1994." "I get a lot of comments saying 'WHY DOES THIS WORK?' " Johan Olsson says. "Besides the '80s sound and fashion being pretty popular at the moment, I think it's mainly the fact that people like hearing songs from a whole new perspective." That said, not all remixes are created equal: There is an art to combining musical styles, and the most transcendent revamps demonstrate obvious artistic expertise and ingenuity. It helps if the source material can withstand manipulation and still maintain its emotional essence; SxAde's remix of Lana Del Rey's "Summertime Sadness" is Exhibit A. The element of surprise is a plus: It's not obvious that Linkin Park's "Numb" could successfully pair with glittering, Stock Aitken Waterman-esque production, but here we are. Clever visuals can help, too: Calvin Harris and Rihanna's "This Is What You Came For" feels like a forbidden late-night cable access show thanks to the way YouTuber Saint-Laurent adds static and VHS degradation to the song's original clip. In TV shows such as Stranger Things and GLOW, the cult genre vaporwave and the steamrolling persistence of Toto's "Africa," the 1980s are alive and well — but there is something exceptional in how YouTube remixers commit to the era's limitations. Synthesizers like the era-defining DX7 had a certain charming clunkiness, and a shared aesthetic of squiggly stabs, percussion rattles and bass slaps proliferated in '80s pop production. Although today's pop music certainly has its unique inventions (trap, for example, is having a mainstream moment right now), the trends tend to be more more ephemeral: It's harder to point to a focused, dominant sound that can vividly evoke the 2010s. For as faithfully as they recreate their namesake, YouTube's '80s remixes actually remind me of a more recent moment. The internet music culture of the late '90s and early 2000s was a period of rapid transformation, but even as illegal file sharing accelerated music discovery, the shortcomings of the technology kept things grounded. MP3 collections took up vast amounts of digital space and were playable only via certain programs. And, like record store crate-digging excursions, online hunts didn't always pan out: You might spend hours downloading a song, only to find out it had been mislabeled. These '80s remixes are also renegade efforts, albeit made with love, and too exist only within a limited framework. They're not for sale, and in most cases can only be streamed, not downloaded. Sifting through dozens of re-dos to find the true gems requires patience, and leaves room for the chance that a listener might stumble on something enchanting and different. Especially for listeners too young to have firsthand '80s nostalgia, the longing they provoke is for the early promise of music on the Internet: the pre-streaming, pre-algorithm days when throwing yourself into exploration yielded mind-expanding dividends.